Every once in a while I get to work on something special, something that leaves me with the keys to open new doors. Not long ago I came across a certain font related vulnerability, it was a 0day being exploited in the wild. The vulnerability was in a driver I was somewhat familiar with  ATFMD.SYS. But what caught my eye this time was how the exploit was getting System privileges in a very elegant and clean way. The mechanics of this technique involve patching the kernel structure representing a bitmap (SURFOBJ), turning it into a powerful arbitrary read/write primitive. Alex Ionescu touched on the subject of Win32k shared memory regions in his excellent 2013 talk. But he didn't mention this one, in fact the only previous mention of this technique I could find was by Keen Team in June 2015 . For simplicity, every data structure and offset discussed is known to be valid on Windows 8.1 x64. pKernelAddress points to the entry's BASEOBJECT header which is followed by a specific structure according to its wType. 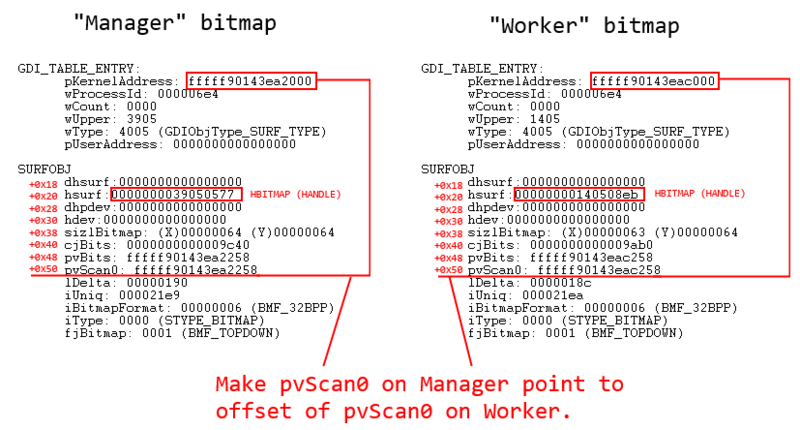 For 32bit BMF_TOPDOWN bitmaps all we care about is pvScan0, a pointer to pixel data (start of 1st scanline), and what user mode reachable GDI functions like GetBitmapBits and SetBitmapBits ultimately operate on. Note that although we cannot access those structure members from user mode code, nothing stops us from calculating their address. This means we can leverage a number of ring0 vulnerabilities and turn them into pretty reliable exploits, completely bypassing current windows kernel protection mechanisms. Now we've turned that write-what-where-once to arbitrary read/write of any virtual address, and we can use it as many times as needed. We can use this to fix corrupted pool chunks, steal process tokens, and a bunch of other fun stuff! gConfig requires some explaining. Some Undocumented structures tend to change from one Windows version to another. EPROCESS is one of them, and that means offsets to its members also change quite a bit between windows versions. Since we need to get UniqueProcessId, ActiveProcessLinks and Token from EPROCESS, we need to find a way to know the offsets to correctly access their data. To simplify this demonstration I've chosen to have a structure filled with those offsets pre-set for different Windows versions. Ok, now let's steal that Token, shall we? While researching GDI structures I found I lacked an appropriate tool to make sense of it all, especially when I needed to spray GDI objects all over the place. I knew about gdikdx.dll, but that was last seen 10+ years ago. And nothing replacing it to my knowledge works on x64. So I crafted something that turned out to be usable for me and might be usable for others. 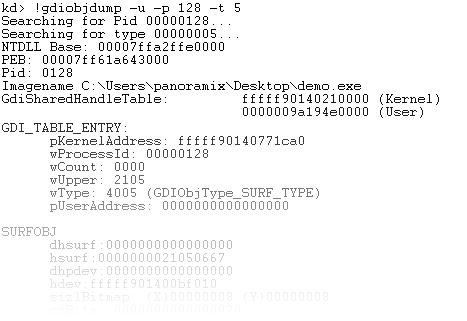 This is a WinDbg/Kd extension to dump information about the GDI handle table and its referenced kernel structures. 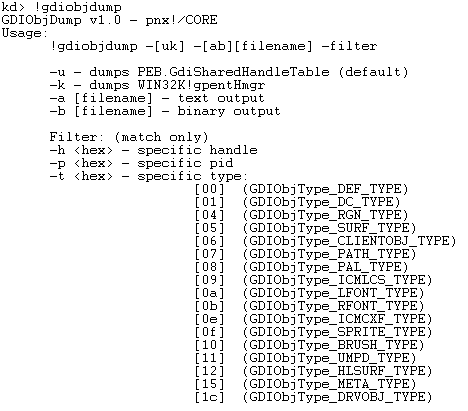 Is a stand-alone application that loads binary dumps made with GDIObjDump and shows a graphical representation of the GDI table. 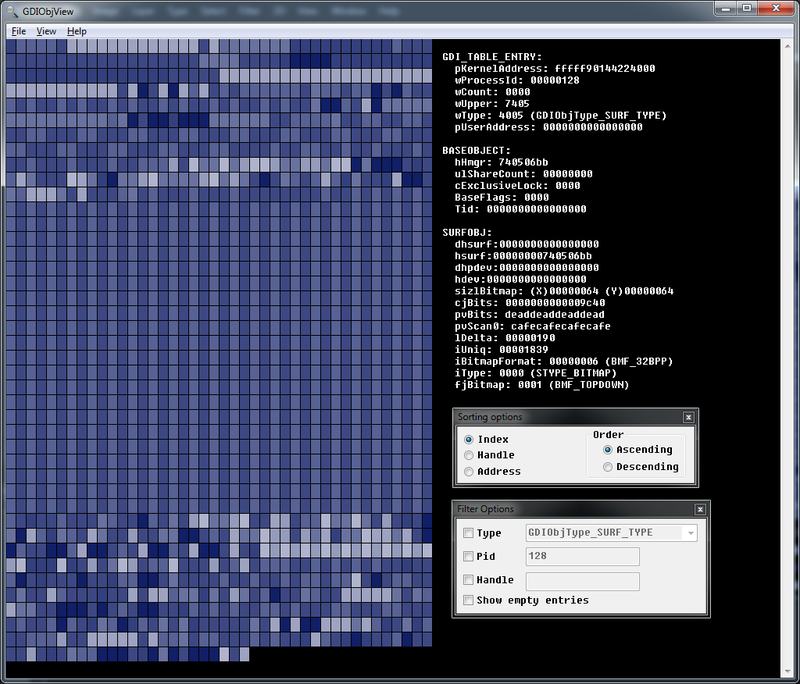 It allows you to sort and filter the GDI entries in a bunch of ways, and click individual cells to view the contents of their kernel structure. Download available at GDIObjDump project page.